What Happens to Your Clothing Donations? When you donate used clothing and textiles to charity bins in your community, there are several ways it can be used to assist communities, besides the local job creating, government savings and environmental benefits. The majority of the clothes are sold, and proceeds redirected to various charities that use funds to continue offering services. 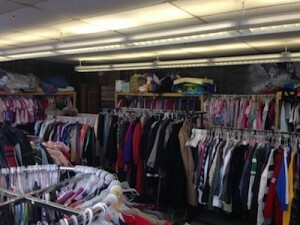 Used clothing collection offers a stable, secure source of continuous operating funds. The charity TWD primarily services, the Canadian Community Support Foundation, redistributes 100% of the proceeds they receive to fund food banks, soup kitchens, shelters, hospices, senior services, youth services and more. The best of your clothing donations most often end up in community closets. Community closets are great, because unlike thrift stores that sell used clothing to struggling Canadians, a community closet provides clothing for free to vulnerable residents. Community Closets offer free services to local shelters, child protection agencies and other social service agencies and work on an emergency referral basis. Community Closets do more than just provide warm clothing. Clients served by community closets are often in crisis. For example, when children are removed from their home by Children’s Aid, or victims of domestic abuse or survivors of house fires and floods leave their homes with nothing but what they are wearing. When a client is referred to a community closet, they are usually starting from scratch, and literally need everything. Most community closets are not open to the public and work by appointment so that there is complete privacy. Clients are the only ones in the store and get undivided service and attention. The experience is cozy, nurturing and peaceful. Clients are outfitted with an entire wardrobe, for free, so that they can ‘start over’ with clothing they can feel confident in. If finding work is a consideration, appropriate interview clothes are provided as well. Community Closets serve the most vulnerable in our community. Community closets accept used clothing donations from the general public and sometimes partner with recyclers who collect in their community. They normally have very little space to store inventory, meaning they have to be very discerning about what they put on their shelf or racks. Less than 50% of the donations they receive are actually suitable for their clientele. The rest is traded to thrift stores in exchange for vouchers, or traded back to their recycling partner. They may also choose to sell what they cannot use to companies like TWD, to supplement their budget. Some community closets use the funds they receive from ‘outbag sales’ to buy diapers and hygiene products for their clients, and others that use the funds to supplement their utility bills. Even if the clothes you donate don’t end up on the shelf of your local community closet, the proceeds your donations generate help keep keep community closets open. Your donations help, and you can feel good about that! 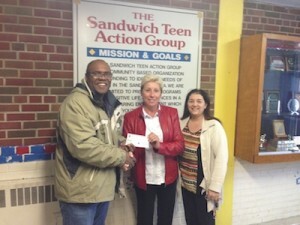 This is Sandwich Teen Action Centre’s Community Closet in Windsor Ontario. Managed by Kelly Quinlan, this room is not just filled with lots of clothes, but also filled with plenty of healing love.